Rough seas, bad weather, sinking ships and pileups make for more than an iota of adventure. 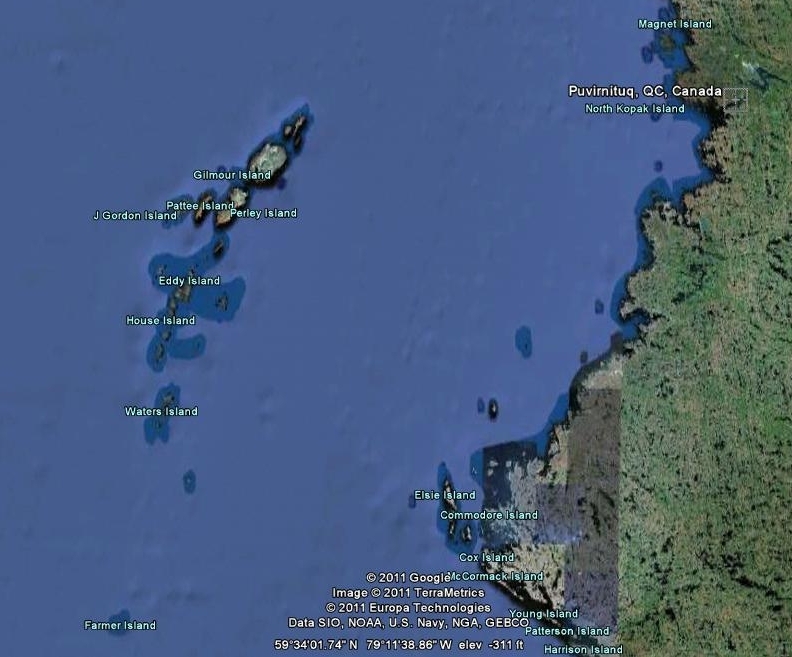 The Ottawa island group, referred to as NA-230 for the IOTA program, consists of 34 uninhabited islands located in the eastern part of Hudson Bay, about 160 km from mainland Canada. It has never been activated before so I decided to put this arctic isle on the air. For its first activation, Industry Canada issued me the special call sign VYØO. With no helicopters available the only transportation was by boat. Mario Aubin from the Nunavik Arctic Survival Training Center in Puvirnituq worked tirelessly to provide me with the required logistical support. Little did we know it would be a memorable trip, in which skill and determination allowed the team to recover from a series of difficulties that almost turned deadly! I planned to drive to Montreal to board a plane up north. 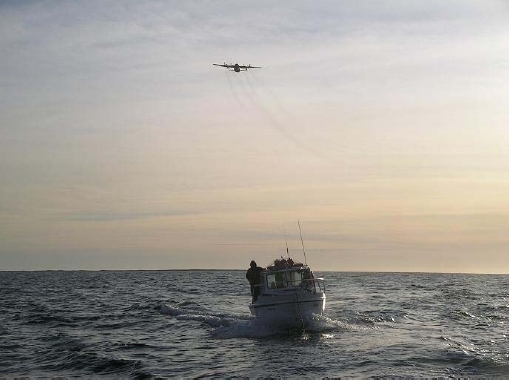 It took our Air Inuit 50 seat Dash 8 plane 6 hours to get to Puvirnituq, with stops in Kuujjuarapik, Umiujaq and Inukjuak. 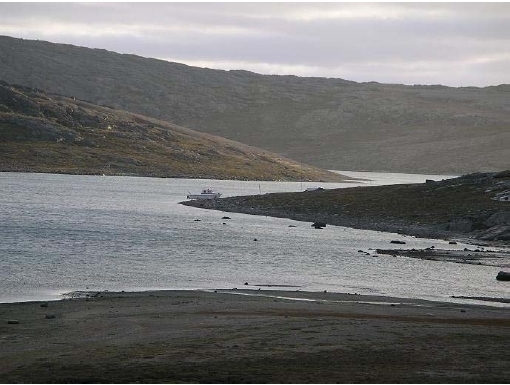 Partly sunny but cold upon arrival, Puvirnituq is located on the shores of the Povungnituk River. 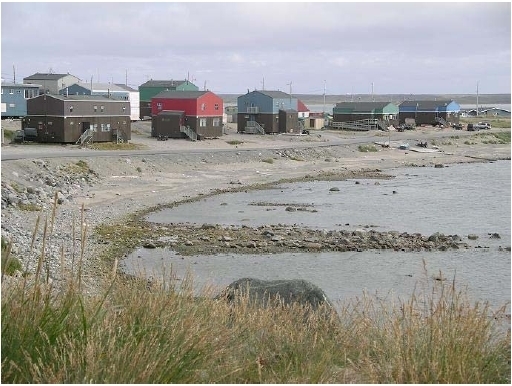 With 1500 people Puvirnituq is one of the largest of 14 villages in Inuit Nunavik, the northern third of Quebec. Mario was waiting for me and we went straight to see the 26 foot boat he retained for my trip. Tullaaq or “Baby Loon” had a powerful engine, capable of 30 knots. He estimated that, fully loaded, it would take me to the islands in less than 6 hours. It was Saturday afternoon and I felt in great shape, hopeful that we would set sail on Monday morning. A couple of stores provided a good selection of groceries, albeit three to five times more expensive than back home. After shopping, I walked around the community. Lined up in a systematic, predesigned pattern, houses are elevated because of the permafrost, having wood siding topped off in bright colors (see Figure 1). Canoes and snowmobiles dot the properties and ATVs roar up and down the paved roads. Sunday, I met brothers Jakussie and Peter Boy Ittukallak, well-traveled carvers who enthusiastically signed up for this project. Peter (55) was the captain, but Jakussie’s (59) support was essential, as he had traveled to the Ottawa Islands some 20 years ago. Two of their grandsons comprised the rest of the crew. The boat was fueled and its engine checked and ready by Monday afternoon. Unfortunately, the weather forecast was grim. Rain and high winds were expected the next few days. The temperature dropped to 3° C on Tuesday, while the wind raged to 80 km/h. These were no boating conditions! The weather remained unchanged for several days, but finally smiled again the morning of September 4, my 7th day up north. Peter picked me up and drove me to the harbor. One of their grandsons had the flu and was replaced by Qalingo Tookalak (58), a very experienced man, who had also traveled to the islands 30 years earlier. The fourth member of the crew was Sailasie Ittukullak (22). Qalingo had analyzed all available weather maps and concluded that our weather appeared calm all the way. With everything loaded, Peter warned me that we would enter the open water and there assess whether to venture across Hudson Bay. At 1:45 PM we set sail for Gilmour Island (see Figure 2). Gilmour is the largest in the Ottawa group, located in its northern part. An 8 km long bay dwindles from south to north, narrowing at its end, thus offering excellent protection in case of a storm. It was mainly sunny and Peter kept sailing smoothly from crest to crest. Now and then the boat would drop slightly into a trough, a move that jarred my spine. The sea was good though, so we headed for the crossing. For the first 3 hours we averaged 30 km/h (16 knots), but over the following 2 hours, the sea forced us to reduce speed. Waves were 1.5-2 meters high, with small white crests every 30-50 meters. An onboard sump pump had to be manually activated for several seconds every 15 minutes to drain the water accumulating in the engine compartment. Suddenly, its activation button disappeared into the instrument panel! Trying to extract it led to a short circuit, burning the fuse and rendering the pump unusable. Shades of Murphy? Qalingo pondered this problem when, 5 hours into the trip and 27 km from the southern tip of the island, Tullaaq’s powerful diesel engine stopped functioning. It didn’t take him long to realize that our main engine could not be fixed. 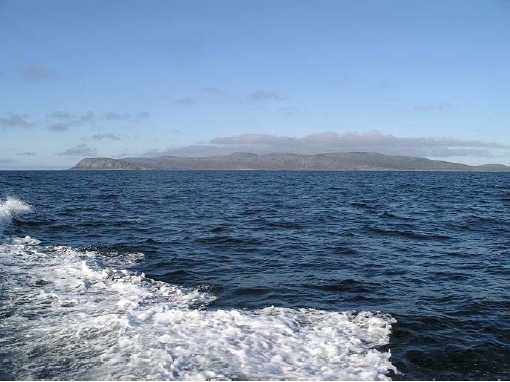 Gilmour Island, its volcanic cliffs rising abruptly tens of meters above the water, could be seen in the distance. 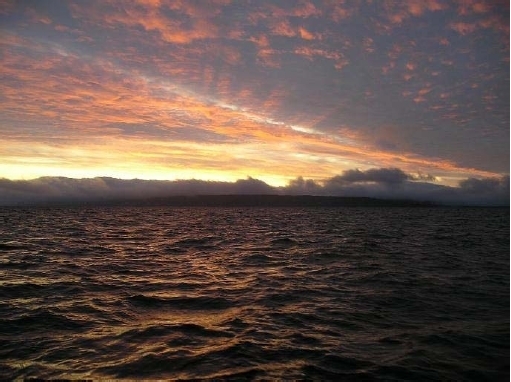 We were 1.5 hours from sunset with a line of dark clouds on the horizon above the island, gradually moving to cover it. The entire crew worked like madmen to install a spare 25 hp gasoline engine and we were soon moving again, this time at 9 km/h. As darkness fell, the wind picked up and our speed dropped to 6-7 km/h. From time to time the engine sputtered and had to be opened, its gas line checked, its spark plugs dried. Distant, dark silhouettes announced the presence of nearby islands, while clouds thickened above us. Despite our dire situation, I could not stop admiring the awesome colors of a dramatic sunset (see Figure 3). 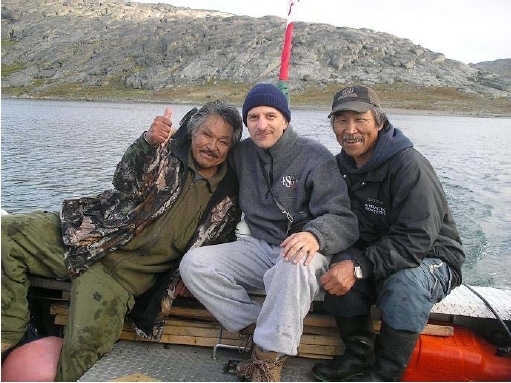 Annoyed by our slow progress, Peter shared with me an old Inuit legend “Shooting toward one’s destination would shorten the distance.” Without delay, he picked up a rifle and fired once toward the island. Then a few more shots, while our cheers accompanied sparks shooting from the rifle barrel like fireworks. As dusk darkened everything around us, we had a very long night ahead. The sump pump wasn’t working, so we had to bail the water from the engine compartment. Sporadically, the small engine would stall and had to be disassembled and fixed. It was getting cooler and the windshield had to be manually wiped. We were exhausted! Progress was agonizingly slow. Despite a full moon, the clouds made visibility dangerously poor. We were navigating mainly by GPS with one of the crew on the bow checking for rocks. We finally reached the southern tip of the island and prepared to enter the long, meandering bay. Qalingo extended his arm toward the crested shore, proclaiming: “From now on we will name this Cezar Point.” Jakussie strongly nodded his approval, while I looked at them — speechless! They wanted to celebrate my coping skills as conditions worsened, a first sign that a strong bond was developing between us. The crew insisted that I share in their rifle-shooting tradition. Peter reloaded the gun and handed it to me. I stepped onto the edge of the boat, aimed at the island’s shore and took a couple of shots. Everyone cheered! The stubborn island certainly didn’t get any closer. But despite the difficult situation we were in, at night and far from land, we kept ourselves in good spirits. Sailing through the bay using GPS allowed us to skirt the rocky shores. As we moved farther north, the bay narrowed, increasing the danger of hitting something. Close to the end of the bay, a place known as Murray Harbor, the boat hit sandy sea bottom in mid channel. We pulled back into deeper water, using two long poles. Two of us sat on the bow, continuously testing the water’s depth. Navigating in the dark, given all the problems we had had, made us forget that water accumulating inside the engine compartment was dragging down the entire boat. Suddenly, I noticed the water level inside the boat starting to rise — rapidly! Only a huge adrenaline rush enabled me to lift battery after battery, stowing them inside the cabin. Following this feat, I scrambled to stow the generator, water canisters, food containers, heating fuel, cooking gear and utensils. Meanwhile, Peter was on top of the cabin, helping Sailasie stash the gas canisters. Jakussie, Qalingo, Peter and Sailasie bailed frantically. With the weight redistributed, Tullaaq’s rear lifted a little and the water level dropped enough to reveal three holes just above the floor. Qalingo immediately plugged them by jamming in pieces of cloth with a screwdriver. Meanwhile, frantic bailing continued until the engine compartment was dry. Our boat had started to sink so rapidly that we had no time to don our rubber boots or gloves, so our feet and part of our pants were soaked with freezing water. Sailasie, now completely frozen and shivering with reddish hands, had spent time in knee-deep water, bailing seawater with bare hands for what seemed an eternity. We were finally out of immediate danger. We turned the heater to high, removed our soaked boots and socks and lining them up to dry. A steaming cup of tea later, we were ready to continue our search for the passage to Murray Harbor. Soon, the engine shutdown again! Qalingo opened it up, removed the spark plugs, dried them and checked the gas. With our boat drifting and swelling and with only partial lighting from a flashlight, he started reinserting the spark plugs and we finally got under way. Despite numerous attempts to reach the end of the bay, the Tullaaq always hit the sandy sea bottom. At 4 AM, over nine harrowing hours after the main engine had died, we felt that enough was enough. We made for shore. Sailasie secured the boat just short of landing, which was postponed until sunrise. We couldn’t see a thing in the blackness. Each of us found a place in the cabin to lie down, while the heater warmed our weary bones. I tried to nap for a couple of hours. Ahh! Six AM found us up and dressed warmly, ready to step onto the island. Qalingo and I went first, heading straight for a hill in front of us. Once on top, we realized that we had anchored in the best landing place, less than 1 km from the end of the bay where two creeks enter (see Figure 4). Guarding the entrance to Murray Harbor was a log cabin, still standing, but damaged by the elements and polar bears. 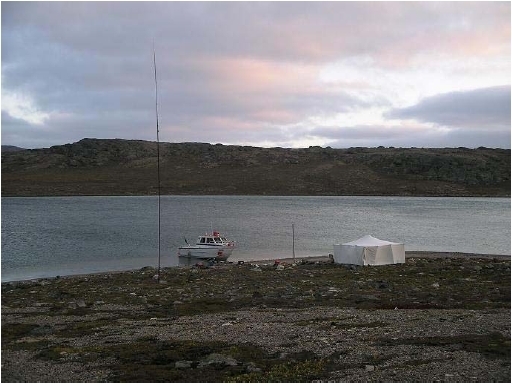 With everything unloaded, I began to set up the antenna while some of the crew worked on the tent. We were exhausted and hungry, after fighting everything that fate could throw our way. I just wanted to get on the air, but the guys convinced me to eat and have a cup of hot tea first. Now, with energy levels up, I was ready to roll. My rig was an ICOM IC-7000 with a vertical wire antenna taped to a 10 meter telescopic fiberglass mast. Very high SWR values indicated that the antenna wasn’t working well. Nothing seemed to come easy on this trip. Since the antenna had no traps and the SWR was huge on all bands, I began to suspect the coax. Taking the mast down one more time, I noticed that the coax was sliding too much inside the BNC connector. With no spare coax or a soldering iron, the connector had to be opened, coax removed and then reattached solidly. I tried to heat up a screwdriver but our heater wasn’t hot enough. The only choice left was to cut the coax, strip it carefully, put away the connector, attach each of its two ends to the appropriate part of the BNC and fix it in place with electrical tape. Qalingo helped me with that and tests proved that we did an excellent job. At 15:46Z I was finally able to call my first CQ on 20 meter SSB and a colossal pileup came back to me in no time (see Figure 5). The first few hours went by quickly. Gradually, I started to feel the effect of the long night and I couldn’t concentrate on the fast pace. Unruly Europeans in the pileup weren’t helping either. I wasn’t sure how long we would stay on the island, but I knew that once the main engine was fixed, we would leave. Thus, I had to stay on the air continuously, to give as many stations as possible a chance to log NA-230. That afternoon I felt my left arm burning. I recall having had an itching sensation earlier in the day but ignored it. I removed my fleece and noticed that the left sleeve was shredded and the skin beneath was badly scarred. My jeans had a huge brown stain on the left side. When I had carried those large batteries as the boat was sinking, I had felt cold water pouring inside my sleeve and splashing on the jeans. Apparently, it wasn’t water but leaking sulfuric acid! I cleaned my ravaged skin with seawater and changed my shirt. As the wind picked up, the first raindrops fell on our tent (see Figure 6). Since I was mainly interested in logging as many stations as possible, I ran SSB on 20 and CW on 30 meters. Few contacts were made on 20 and 40 CW. I managed to stay awake all night but it was really hard at times. The heater warmed up the tent till it ran out of fuel; then the cold took over. My jeans were shredded, but it was so cold that I had to wear them under a pair of sweat pants. Next day, the weather worsened, with winds up to 80 km/h and severe rainfall. I wasn’t sure that the fiberglass mast would survive in one piece. The boat’s main engine was leaking oil and an air bubble was interfering with its operation. Qalingo fixed it, but couldn’t find out why the latter happened. We were ready to leave the moment weather conditions allowed us. Despite the very high winds, I left the mast up and continued on the air. The second night, the wind and rain intensified and the tent leaked. Leaving the next day was out of question. When I went to bed late that morning, my crew decided that I was in dire need of some rest and did not awaken me as I had requested. When I got up, the weather was nice ? blue sky, partly sunny, not too windy, inviting me for a stroll. Together with Sailasie, each of us with rifle in hand, we walked toward the log cabin. 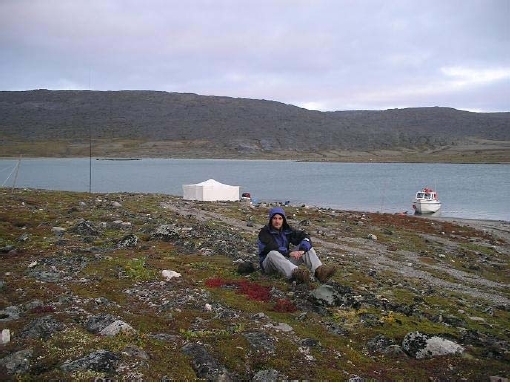 Nestled 700 meters away, our camp was a tiny outpost in the middle of the frigid wilderness (see Figure 7). Looking at Earth from space wouldn’t have been more spectacular in that moment. It felt so good to know that we were in touch with the rest of humanity. The other guys found polar bear tracks 1.5 km south of our camp. We had to be careful when leaving the tent. Moreover, Qalingo loaded his rifle and kept it by his sleeping bag. That evening, the crew listened for quite a while to the SSB and CW pileups. They agreed that a polar bear would best be scared by yelling “CQ, CQ!” It was no joke, as this reminded them of “seku” — “ice” in Inuktitut. That night, as I went out to switch the antenna from band to band, I looked carefully around the tent to avoid any surprise encounter. The crew awoke and started to pack. I was told that we would leave soon, but that I could continue on the air for a while. The best propagation to Europe on 30 meters was the previous night and I wanted to test it this morning with Asia. The JA pileup strengthened just after 6 AM (1000Z). 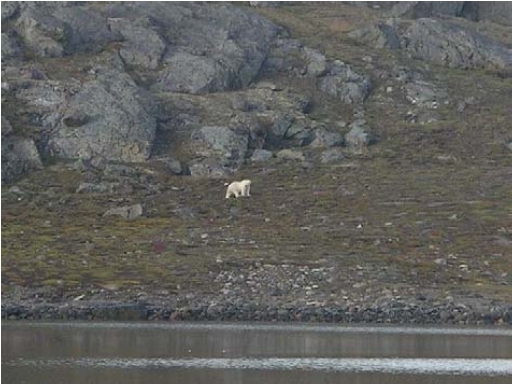 I was in contact with JA1SKE when a polar bear appeared on the opposite side of the bay. I finished the contact and ran out with camera in hand and saw a huge, majestic bear with fur of immaculate white (see Figure 8). We watched in admiration. I kept running in and out of the tent, working the JA pileup, taking photos and short movies, as the bear stalked us for a while and then the crew scared him away. The guys removed the tent while I kept operating in the open until 7:30 AM, when I signed off (see Figure 9). VYØO was now history. It was a superb morning, with shining sun and calm sea, as Tullaaq sped away (see Figure 10). The rocky cliffs of Gilmour Island were rising from the waters surrounding us. Swinging by “Cezar Point,” we headed east. After cruising for 1.5 hours, the main engine stopped once again! Qalingo went to work, adding oil and bringing it back to life. Shortly thereafter, as we were having some snacks, he pushed a large box toward the cabin’s wall. Suddenly, the cabin filled with a thin, suffocating yellow dust, quickly engulfing the entire boat and reducing our visibility. Peter didn’t know what happened, as he jumped off his seat, eyes glued to the windshield. I surmised that a hidden fire had triggered an explosion! Fortunately, it was only a paper bag overfilled with fire-retardant that had been jammed inside a niche and burst. We couldn’t stop laughing hysterically! “What more can go wrong?” I asked, smiling. It didn’t take long for fate to answer. We were past the halfway mark when we heard a loud mechanical noise and the engine stopped again! For a few long seconds nobody said a word. Qalingo checked the engine and announced that the gear was broken. We fired up the small engine, with Sailasie in charge of maintaining direction using the GPS. We still had 79 km to Puvirnituq. At 9 km/h it was going to take a long time! Using the 40 meter HF radio on board, the crew was informed that winds were supposed to pick up from the southwest and intensify later that night. Mario wasn’t keen just to sit and wait for events to unfold. A larger boat was coming our way. At our request, they contacted the Search and Rescue Center, who dispatched a large CC-130 Hercules aircraft from its base in Trenton, Ontario. The boat coming to our rescue was the 44 foot Amaulik, with Captain Olivier and his crew of five. We met them 25 km from Kopaak Island and transferred some heavy stuff to the other vessel. Jakussie and I boarded it, while “Baby Loon” prepared for towing. Sailing at over 13 km/h, the island contours were visible when the Hercules showed up. It was quite emotional to see the huge aircraft buzz us at very low altitude, its cargo door open wide, ready for a drop-off. It circled us for an entire hour(see Figure 11)! As we approached the village, a speedboat and motor canoes welcomed us. The sun was setting past the Ottawa Islands when we reached the harbor. I thanked the captain and crew of Amaulik, after which Mario introduced me to the mayor of Puvirnituq, who was relieved to see us safe and sound! I hugged Jakussie, Peter, Qalingo and Sailasie long and hard! Feelings welled up. Feelings of a strong, special bond between us. Feelings well beyond ethnic, cultural or social differences. Something very basic, going down to the fundamentals of humanity, its instinct for survival, working together to overcome shared danger. It is unlikely that any of us will return to the Ottawa Islands, with the exception of Sailasie. He will be an asset to the next team to activate NA-230 one day. And what a story he will be able to share with them next time on the island! My return to Montreal and then home was uneventful. I couldn’t be any more grateful for that! I am extremely thankful to the two people I love most ? my wife Lucia and son Tiberius. Their strong and continuous support is without measure! My appreciation also goes to Mario Aubin, whose passion and logistical support were essential! I cannot be grateful enough to my crew for their skills and dedication, so critical for our survival and success! By naming the southern tip of Gilmour Island Cezar Point, they have kept a piece of me up north! Financial support received from the following group sponsors is graciously acknowledged: International Radio Expedition Foundation, German DX Foundation, Chiltern DX Club, ICOM Canada and Clipperton DX Club. I am very grateful to David Topp, W5BXX, and Franc Toplak, VE7DP, for their enthusiasm, encouragement and considerable support. Top individual donors include JM1PXG, DK8UH, GØPHY, K6DT, OH1JO, PA3EXX, RN6BY, UA6AF and VE7IG. I thank them very much, as well as all those who were able to offer support via the VYØO page on QRZ.com. QSL cards were generously supplied by IT9EJW. An incredible story? I think you’d have to agree! All photos by Cezar Trifu, VE3LYC. 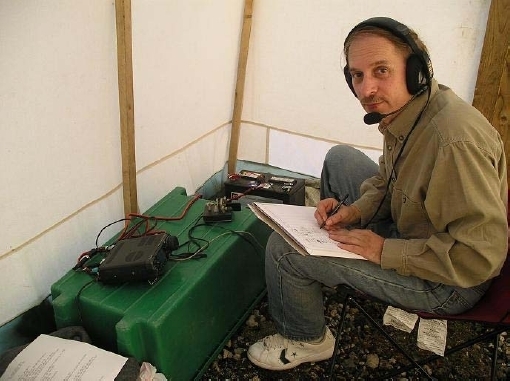 Cezar Trifu, VE3LYC, has been a radio amateur since 1968. His father, YR5TI and YO3TU, played a role in the founding of the Romanian Short Waves Amateur Association in 1937 and in reactivating ham radio after the WW II. Cezar’s interest started with SWLing and he was eventually licensed as YO3YC. Cezar has always been an avid DXer. He moved to Canada with his family in 1992 and was licensed as VE3LYC in late 1995. Since then he has DXCC Honor Roll, over 2400 Challenge points, as well as WAZ (SSB, CW) and 5BWAZ. 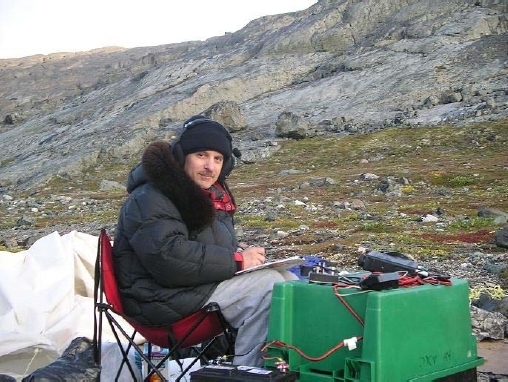 He is particularly interested in the island chasing and has activated several rare and new IOTA groups in the Canadian Arctic. Cezar can be reached at 410 College St, Kingston, Ontario K7L 4M7, Canada, ve3lyc@hotmail.com.